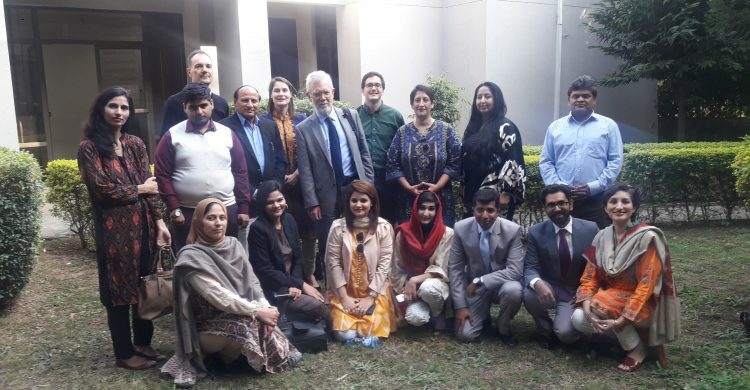 On N ovember 6, 2018, a four member delegation of the Nuclear Proliferation International History Project (NPIHP) from the Wilson Center, USA visited the DSS department, along with their local hosts and partner institution, the CSSPR from University of Lahore. 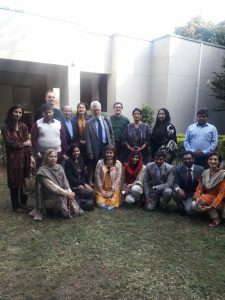 The NPIHP team comprised of Prof David Holloway, Dr. Christian F. Ostermann, Dr. Eliza Gheorghe and Kian Byrne, whereas, the Center for Security, Strategy and Policy Research (CSSPR), Uni of Lahore team was led by its director Dr. Rabia Akhtar. Moderated by Dr Shabana Fayyaz, the visiting delegation was welcomed to the department and speaking primarily on behalf ofthe delegation, Dr. Eliza Gheorghe presented her project titled “Nuclear Alliances: Strategies of Extended Nuclear Deterrence and the Pursuit of Hegemony,” in which she addressed the issue whether a nuclear-armed patron provide deterrence for its non-nuclear allies against a rival alliance armed with atomic weapons. She explained that nuclear patrons can choose from three strategies: giving their junior partners their own nuclear weapons; providing nuclear weapons to multilateral alliances; extending nuclear umbrellas over allies. Her findings indicated that throughout the Cold War, both the United States and the Soviet Union chose the third option. In trying to explain this proclivity for extended nuclear deterrence (END), she argued that behind the two superpowers’ preference for extended nuclear deterrence lay the pursuit of hegemony. Using recently declassified archival materials from both sides of the Iron Curtain, she showed that nuclear hegemons ag eed to some form of nuclear sharing with their allies and gave their junior partners modest input while maintaining a clear hierarchical structure between themselves and the allies. Dr. Gheorghe was later joined by Professor Holloway who enlightened the audience about the aspects of nuclear policy making in the past decades. Kian Byrne, program assistant NPIHP apprised all about how effectively the nuclear archives can be used for quality research and retrieving archival data for gaining information. The delegates were later hosted to a lunch by the DSS faculty.